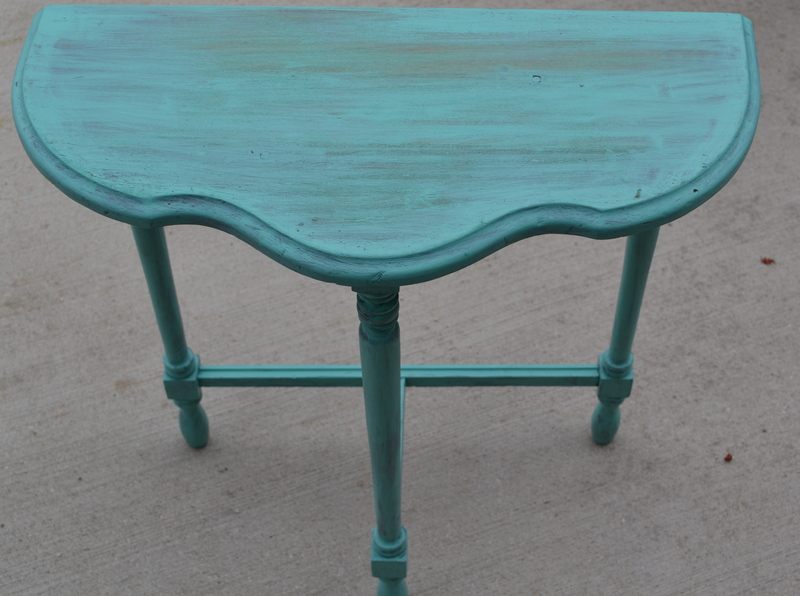 This little half-moon table doesn’t really look so bad here, but it’s a scarred, wobbly thing. I bought it at a thrift store a few years ago because I liked the shape, but, on account of its wobbliness, I banished it to the garage a while back. Every time I put something on it, the cats just knock the whole thing down*. The absence of sturdy tables from my life is something of a family affliction. While the teetering Federal and Victorian examples that clutter my parents’ houses deserve some special consideration, this one isn’t practical, valuable, historically significant, or even particularly attractive. 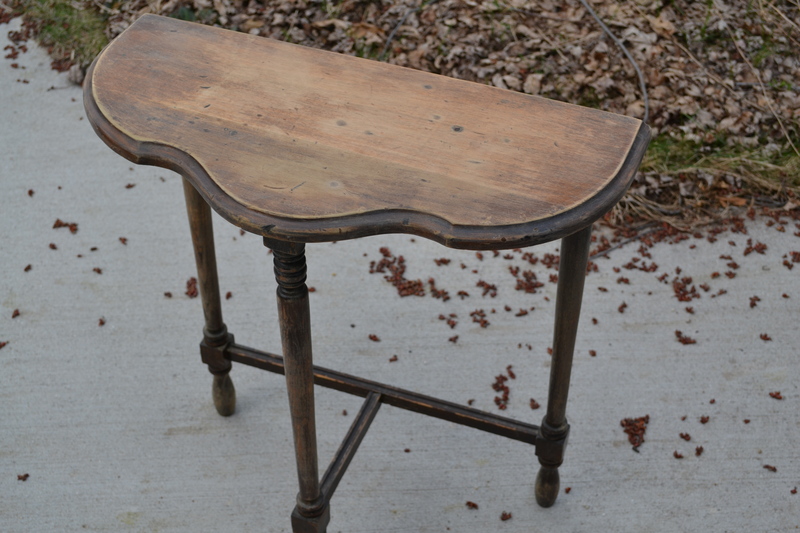 While the sanding did wonders for its complexion, the wood was still pretty unremarkable—the legs, in particular, are some cheap, splintery stuff. 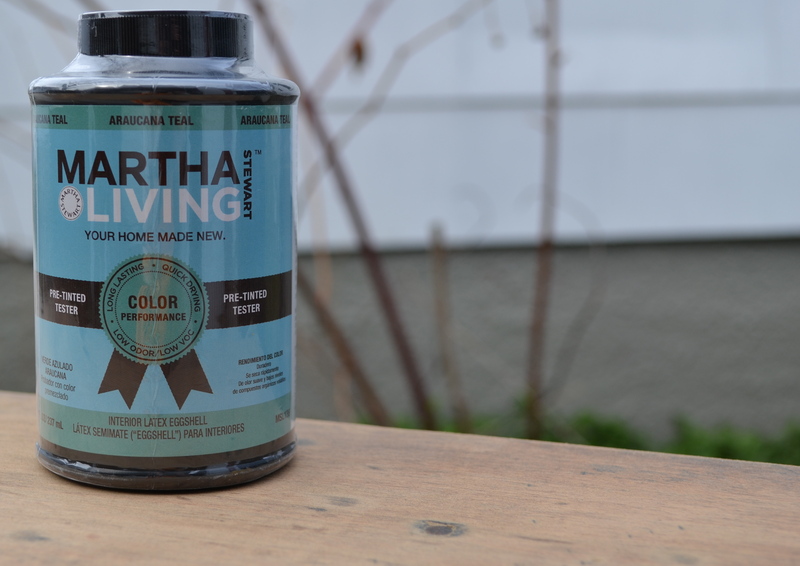 Did you know that Home Depot has a new Martha Stewart paint line? I did. The two Tiffany-esque blues in my house are both from Martha’s now defunct line at Sherwin Williams; she has yet to guide me wrong. I bought this paint sample a while back with the intention of painting something. Nothing in particular, just something. So, I painted something. At first, I was annoyed by the coverage I was getting. I switched from a foam brush to a real brush and then back again. I might add another coat later, but I think that I actually like the streakiness. You may laugh, but I really thought that this color was going to be something different. It looks exactly like everything else in my house. 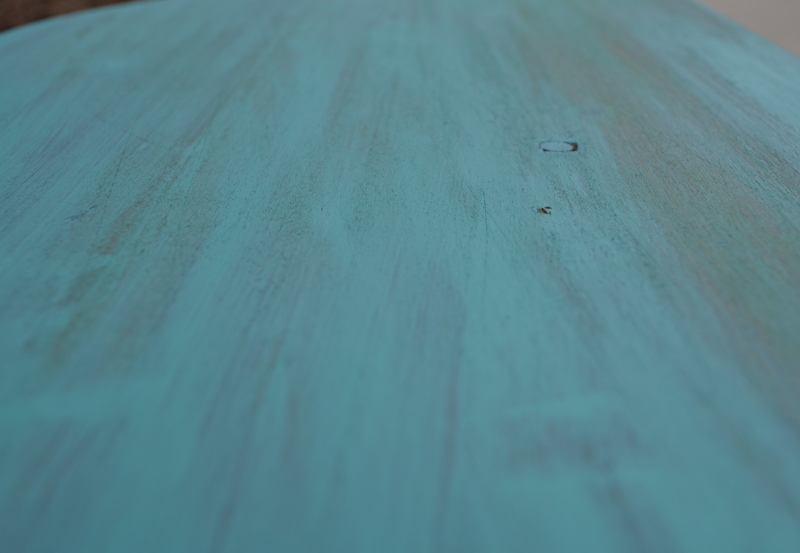 Of course, while the table is now “Araucana Teal,” it is still wobbly and pretty useless. Oh well. Pretty, useless. Indeed. *You can see it in action here; true to my word, the cats soon brought this little still life crashing to the floor.